Summary: The audience becomes completely caught up in the same sense of awe. The thing about walking on a tightrope – from the little experience I’ve had – is that if you make one tiny mis-step, it’s all over; there’s no room for error of any kind. 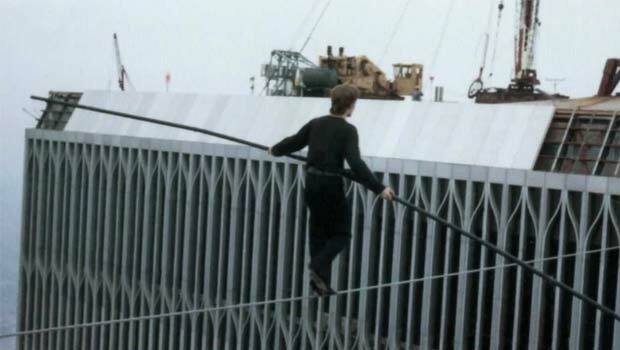 It seems that, for his documentary following tightrope artist Philippe Petit’s attempt to pull off an illegal wire walk between the newly-erected Twin Towers in 1974, director James Marsh has taken his subject’s modus operandi to heart, as he doesn’t put a foot wrong in the composition and telling of this gripping, inspiring and ultimately transcendent film. That these towers, which for the last seven years have been such a potent symbol of loss and destruction, can here be redeemed and reclaimed to represent hope is just one of the film’s many great achievements. Marsh constructs his film using the stock tools of many a previous documentarian – talking heads, archive footage, dramatic reconstructions and the occasional piece of abstract visual illustration – but he has a not-so-secret weapon that immediately gives Man On Wire an advantage over countless other films; his leading man. Frenchman Philippe Petit is a rare breed of human; boundlessly optimistic, enthusiastic and somewhat unpredictable in the way he connects one thought to the next, and his way of describing situations continually inspires and challenges the audience to consider life as much more a spiritual experience than a purely physical one. The film is as much an investigation of this fascinating and sometimes confusing man as it is of the amazing feat he achieved. His retelling of the journey that took him from a dentist’s waiting room, seeing an artist’s impression of the as-yet unbuilt Twin Towers, to walking across a wire between the completed 1,368ft buildings unfolds with such passion, clarity and immediacy that even the most unconvinced viewer will be drawn in within minutes. In the film’s earlier stages Marsh accentuates the humourous aspects of the story, emphasising the rag-tag nature of the team Petit assembled to help him pull off his dream (all of whom add their voices to the retelling), but as the story progresses and the outcome seems less sure, the tone becomes gradually more tense before turning a corner into truly inspiring territory. The director, whose last film was the markedly unbalanced The King, handles these shifts with skill, gently guiding the audience but never resorting to voice-over or heavy-handed direction. Occasionally the score is a touch overblown, but mostly it is the voices of the cast that lead, giving the film a natural pace and genuine power. As those who saw Petit do this seemingly impossible stunt retell just how awe-inspiring it felt to see him walking in the air, the audience becomes completely caught up in the same sense of awe. It’s magical stuff.